Miss Julie Research Papers look at the different roles within society and within relationships that took place in this novel. Miss Julie is a glimpse into two different worlds, the aristocracy of the Swedish countryside and the lower class that serves them. 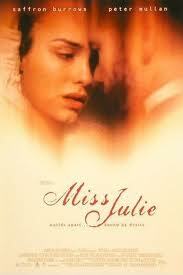 The brilliance of Miss Julie rests in the rich character portrayal accompanied by symbolism and naturalism. The foundation of the plot in Miss Julie is the class struggle of each main character to maintain their proper place in society amidst a scandalous evening of dance and a sexual encounter. Stripping away societal roles, one can witness the basic psychological effect of shifting ego states into a parent/child dichotomy. The motivation behind Miss Julie’s actions is one of the most interesting elements of the play. When first introduced, she is seen as a spoiled aristocrat that uses the people for her entertainment, even those she is supposed to love. Evidence of this exists in the scene in which Miss Julie is commanding her fiancé to jump over her horsewhip, whipping him as he does. As more is learned about Miss Julie, the reader learns that Miss Julie was taught to despise men by her mother who refused to be under the control of any man. On a warm Mid-summer Eve, Julie engages in playful dance with the servants of the house while her father is out of town. She is clearly the mistress of the home and wields her power effectively. She engages a battle of wills with Jean, her father’s valet, and continues to seduce him. Her discourse with him is like that of a mother to a child. “...sit down and I'll take it out. Sit still now, quite still! (she slaps his hands) Come, obey me!" "Sit still, will you! There! Now it's gone. Kiss my hand and thank me”. However, after the seduction is over, the roles of the play advance toward equals as they discuss running away together. When the impracticality of running away together is revealed, Miss Julie becomes childlike under the control of the valet, a wiser and more psychologically stable man. By the end of the play, the roles are completely reversed and Jean is the parent figure and Julie is the child needing direction from Jean. Paper Masters writes custom research papers on Miss Julie and look at the different roles within society and within relationships that took place in this novel.